The Sheikh Zayed Institute's Pain Medicine Care Complex is one of only a few programs in the country focused exclusively on managing pain for infants, children, and teens. When children are unable to express their pain in words, our pediatric specialists have the unique insight to help. As part of the Sheikh Zayed Institute's Pain Medicine Initiative, the Care Complex draws on a multidisciplinary approach to enable treatment of your child's physical symptoms as well as the psychological and emotional aspects of pain. We consider how a child feels and perceives pain, and take steps in care to reduce their fears and their family's anxieties. There is no typical pain patient. The team looks at every part of a child's pain. We develop a unique treatment plan that may blend traditional medicine and alternative therapies to best fit the needs of each patient. Psychological therapy is an important part of the comprehensive care we provide to patients and their families. Children and teens with chronic pain often miss out on activities they enjoy, like hanging out with friends or playing sports. The absence of such normal childhood connections can affect a child's well-being, and additional support from our team can help you and your child cope. Successful treatment for complex pain involves the whole family and the community around the patient. Your child's care team includes your child's primary care doctor, our specialists, as well as you, your child, and your family. Because every child reacts to pain differently, we evaluate the physical pain, how your child thinks about the pain, and how the pain impacts interactions with friends, family, and life in general. As part of treatment, we use cognitive behavior therapy to help a patient think differently about pain. For many children, this approach effectively reduces pain, disability, and distress. Together, we set goals and gradually increase activity levels so your child can become more active and enjoy a normal childhood as much as possible. Ongoing pain impacts a child physically, emotionally, and socially, and it involves the entire family. The Pain Medicine Care Complex team is available 24 hours a day to assist families through urgent pain crises. A treatment plan engages everyone in a child's life as an active participant in the healing process, from the child's parents and siblings to the primary care doctor and teachers. This collaboration between programs means that we offer the most advanced therapies for patients. The institute's Pain Medicine Initiative is one of the leading research centers in the country, developing new medications and interventions to safely and effectively reduce pain for our young patients. Download a PDF about the Pain Care Complex. 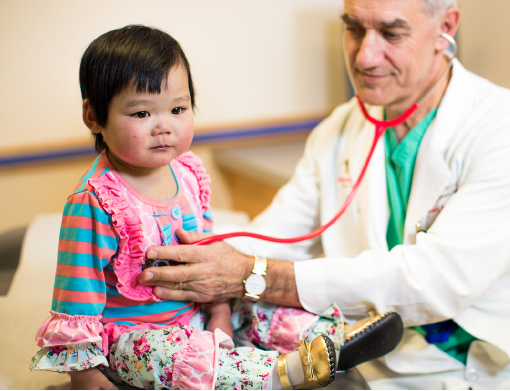 Northern Virginia Magazine has named more than 45 Children’s National Health System physicians to their list of 2015 “Top Doctors.” The leading pediatric physicians included in this elite list represent many specialties within Children’s National including Cardiology and Cardiac Surgery, Endocrinology, Hematology/Oncology, Neonatology, Otolaryngology, Urology, and Surgery. Read our brochure to learn more about services offered to help patients manage acute and long-term pain at Children's National.